Since the 1940s, archeologists had been perplexed by what seemed to be a puzzle piece missing from the prehistoric record of East Asia – large stone tools like the Acheulean handaxes so common in Africa from about 1.6 million years ago, and in Europe beginning around 500,000 years ago. 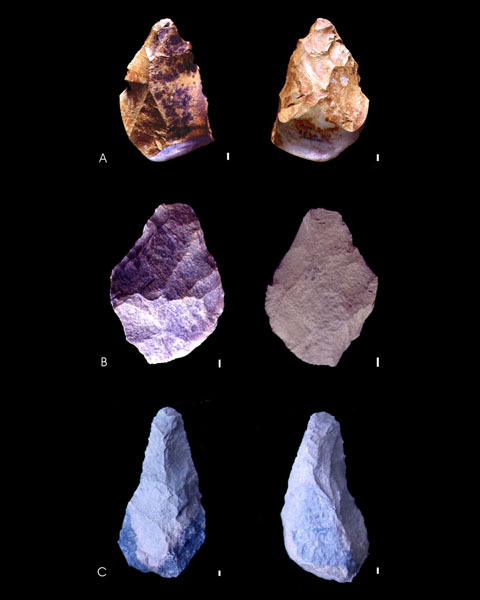 Carefully shaped multi-purpose handaxes were a major invention as early hominins refined their techniques for turning stone into technology. These were an advance over the more basic toolkit of the first toolmakers, which involved chipping flakes from usually small stone cores. 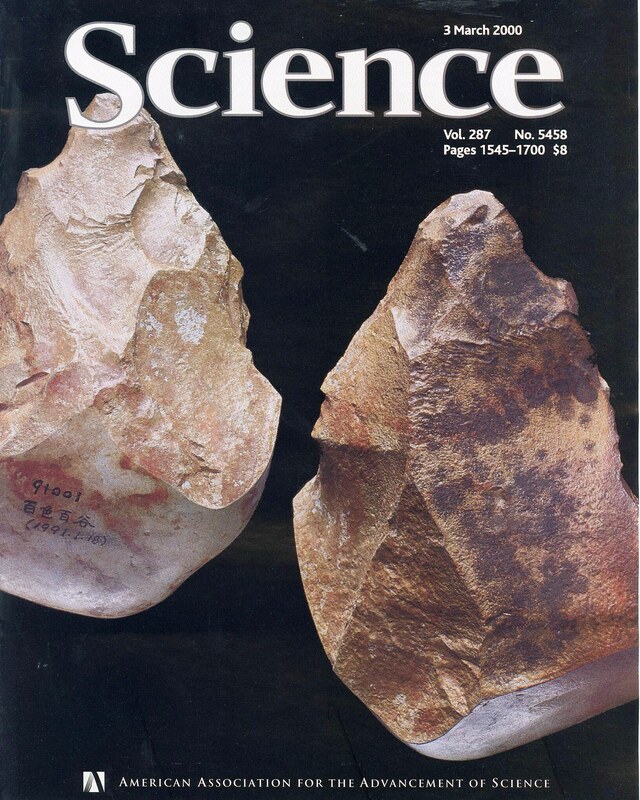 Making handaxes involved a more sophisticated understanding of a rock’s material structure and mechanical properties. Were these implements missing because East Asian hominins were isolated from the more advance toolmakers to the west? Or, because their forerunners departed Africa before the know-how to make handaxes was established? Or, was the knowledge forgotten? One prevalent idea, developed in the 1940s by Dr. Hallam Movius, was that less advanced technology in East Asia resulted from the stable and unchallenging surroundings that prevailed in that region of the world. Our Human Origins team made finds that changed this perspective. Dr. Rick Potts co-directed excavations in the Bose region, Guangxi Autonomous region, with Prof. Huang Weiwen and Dr. Hou Yamei of the Institute of Vertebrate Paleontology and Paleoanthropology, along with other Chinese geologists and archeologists. As reported in the journal Science, our team found the oldest known large cutting tools in China, which resemble the handaxes of their African contemporaries in several ways. These include the intensive striking of flakes from both sides of large ovate rocks, typically river cobbles at Bose (rather than large flakes in Africa), and systematic shaping of a pointed or beveled end versus a rounded opposite end. The overall comparison indicates similar competence and skill in toolmaking in East Asia as occurred further west at the time of the Bose meteor impact, even though the large tool technology at Bose may have been independently developed. The artifacts were excavated together with charred samples of wood and glassy microscopic shards and larger lumps known as tektites – once-molten pieces of Earth rock that radiated out over a vast area from Australia to China produced by an atmospheric impact and heating. The tools occurred solely in the tektite layer – a stroke of luck in that the tektites can be dated accurately – to 803,000 + 3,000 years. 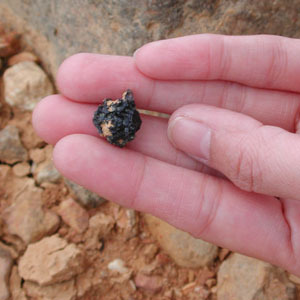 The association of the tektites, charred tree wood, and tools suggests that the forest fires triggered by the heat of the impact and the shower of tektites may have laid waste to the landscape and exposed the vast stone cobble beds, which were sources of suitable materials for making stone tools. The cover of Science Magazine, March 3, 2000, highlighting new findings in southern China. Although Paleolithic researchers are reluctant to give up the ‘Movius Line’ idea dividing east from west, its underlying basis – i.e., the inherent lack of skill of the toolmakers and the lack of a changing or challenging environment – is no longer supported. The cover of Science on March 3, 2000, highlighted these findings. More recent excavations in limestone caves of the Bose-Bubing basins, in collaboration with Dr. Wang Wei of the Natural History Museum of Guangxi Zhuang Autonomous Region, have unearthed many fossil teeth of mammal species, which allow faunal change in southern China to be described for the first time. The fossils from some of the caves may stretch back to around 2 million years, and could offer evidence of whether early hominins and other large primates lived or passed through this region. Stay tuned for new results! Hou Y., Potts, R., Yuan, B., Guo, Z., Deino, A., Wang, W., Clark, J., Xie, G., Huang, W., 2000. Mid-Pleistocene Acheulean-like stone technology of the Bose Basin, South China. Science 287, 1622-1626. Potts, R., Huang, W., Hou, Y., Deino, A., Yuan, B., Guo, Z., Clark, J., 2000. Technical comments on “Mid-Pleistocene Acheulean-like stone technology of the Bose Basin, South China,” Science 287, 507a. Potts, R., 2001. Mid-Pleistocene environmental change and human evolution. In Human Roots: Africa and Asia in the Middle Pleistocene (L. Barham and K. Robson-Brown, eds. ), Western Academic Press, Bristol, pp. 5-21. Wang, W., Potts, R. Hou, Y., Wu, H., Chen, Y., Yuan, B., Huang, W., 2005. Early Pleistocene hominid teeth recovered in Mohui cave in Bubing Basin, Guangxi, South China. Chinese Science Bulletin 50, 1789-1883. Wang, W., Potts, R., Yuan, B.Y., Huang, W.W., Hai, C., Edwards, R.L., Ditchfield, P., 2007. Sequence of mammalian fossils, including hominid teeth, from the Bose region caves, south China. Journal of Human Evolution 52, 370-379. Your contribution will support our science teams as they study the span of human evolution, from earliest origins to the emergence of our species.